Melt 2 tablespoons butter in a large skillet over medium-high heat; add apples; sauté 5 minutes or until softened. Remove from heat; cool completely. Prepare Caramel Sauce. Reserve 1/2 cup Caramel Sauce. Beat butter at medium speed with an electric mixer until creamy; gradually add sugar, beating well. Add eggs, 1 at a time, beating until blended after each addition. Combine flour, baking powder, and salt; add to butter mixture alternately with milk, beginning and ending with flour mixture. Beat at low speed until blended after each addition. Stir in vanilla. Pour batter into a greased and floured shiny 9-inch spring form pan; top with apples. Drizzle with 1/2 cup Caramel Sauce; sprinkle with Streusel Topping. Bake at 45 minutes. Cool in pan on a wire rack 30 minutes; remove sides of pan. Cool completely on wire rack. 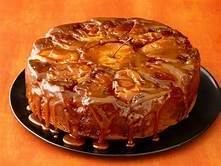 Drizzle with 1/2 cup Caramel Sauce.